About 15 pigs were let out of a Morgan Hill farm on Saturday night, many of which suffered deep cuts and bruises while they were loose, according to high school students and teachers who oversee the farm. Ellie Fisher, a junior at Live Oak High School, which runs the farm, said on Monday that she believes someone may have released the pigs as a prank. 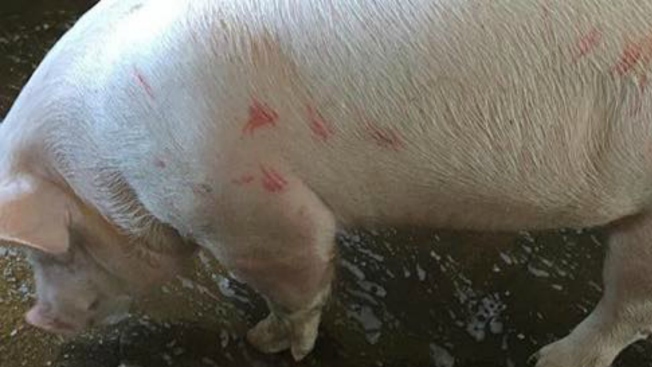 She doesn't believe the person meant to harm the pigs, but they sustained bruises and cuts, she suspects, when they freaked out after leaving the pen. "People who are not educated on pigs, are not aware of the fact that they are very aggressive and territorial, and when they are together, they fight," Fisher said. She said she reported the incident to Morgan Hill police, but they did not immediately respond. Morgan Hill’s Future Farmers of America farm is run by Live Oak High School, where students enrolled in an agriculture class have the opportunity to take care of their own pigs. Kati Whitmyre is in charge of the Live Oak FFA program and knows how much dedication the students have for the animals they raise. "It's pretty upsetting because I know how much time my students invest in their projects," she said. "They invest time, they're out their twice a day feeding their animals." The students and teachers at the high school are hoping the pigs improve before the opening of the Santa Clara County Fair, which is being held in less than two weeks. Fisher said her pig, Tank, and many others are having trouble walking because of injuries to their hind legs. Although the school doesn’t have money for security cameras, Fisher is hoping they are able to find out what happened in order to properly take care of the pigs. "I’m less concerned about who did it," Fisher said. "I really just want to know what happened because these pigs are a huge economic and time commitment, and the consequences could be costly." Another student, Christian Mendoza, said if it was a prank, it wasn't a very amusing one. "My teammates, they have animals out there as well," Mendoza said. "And seeing someone came out there and let them all out and potentially damaging the project they invested so much in, it really hurts."